Royalty, celebrities and thousands of ordinary people owe a huge debt of gratitude to Cedric Robinson. 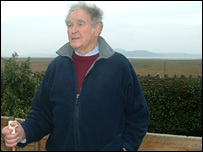 For almost half a century, he has guided countless groups of people over a safe path across the potentially treacherous Morecambe Bay. And he has done it for a "salary" of just £15 a year. Cedric is preparing for his 43rd year as the Queen's Guide to the Sands - and despite being 72 years old, he has no intentions of retiring. 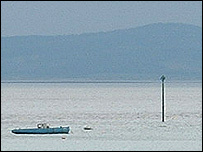 He has lived in the Morecambe Bay area his entire life and became the 25th official guide when he was given the job. Born in the village of Flookburgh on the south Cumbrian coast, he was fisherman, cockler and coastguard before taking up his current role of organising the now-famous cross-bay walks which can involve up to 600 people. These usually take place between Arnside and Kents Bank in Cumbria, and once a year from Hest Bank in Lancashire, at weekends between May and September. Cedric lives with 82-year-old wife, Olive, in a cottage at Grange-over-Sands called Guides Farm, which is owned by the Duchy of Lancaster. His nephew Kenny often helps him on the walks, which are usually no less than eight miles long and can take up to three-and-a-half hours. Cedric said: "It's a gorgeous walk across that bay. A lovely evening stroll with the sun going down - there's nowhere nicer." Olive takes all the bookings from groups and individuals. Many want to do the walk in aid of charitable causes, but anybody can book to go on it. "Olive's diary is as big as the Bible and as thick," said Cedric. "She devotes a lot of time to it. "The walks must have raised millions of pounds over the years to charities. The guide isn't allowed to charge but he's allowed to take tips or gifts - and it's appreciated." Quicksand, fast-rising tides, swirling currents and deep tidal channels are the perils that await anyone without Cedric's life-long knowledge of the beautiful - but notorious - bay. "I've seen two horses go down in quicksand and tractors disappear in seconds never to be seen again," he said. Cedric, who always takes a stick and whistle with him on the walks, said: "I can read the sands like others can read a newspaper." Many famous people have enjoyed his company on the walk, including Prince Philip and the late Sir Harry Secombe. Cedric has twice met the Queen and been given honorary fellowships by the University of Central Lancashire and Lancaster Universities, in addition to receiving the MBE and many other awards. A brass band enthusiast - he plays the trombone - Cedric is also the author of six books about Morecambe Bay. He had a heart by-pass 12 years ago, but has no plans to hang up his whistle and stick. He said: "I've known nothing else. It's been my life and I wouldn't like to retire as long as I'm fit and well. The walking does me so good. I enjoy it and enjoy meeting people. "We haven't had a holiday in 50 years, but we are widely known and meet lots of lovely people. "People come to Guides Farm and say it's like stepping back in time."